The Masters Degree in Corporate Law (MCL) is a full-time nine month programme that provides students with the opportunity to study aspects of corporate law in depth from a theoretical and practical perspective. Full details concerning the MCL are available on the MCL’s website. The website has been designed to provide full information to those who might be interested in joining the MCL and to those preparing an application. 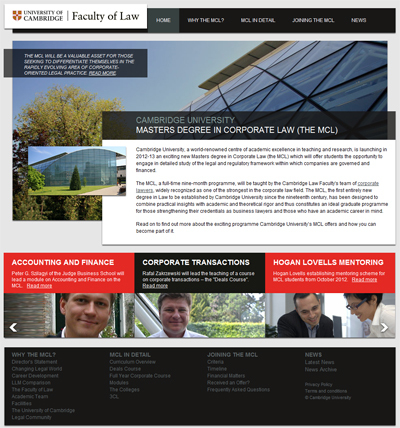 The website accordingly is oriented around three basic themes: 1) Why the MCL? 2) The MCL in Detail 3) Joining the MCL. The MCL website has been organized in an easy-to-navigate manner and is easily accessible on all major internet platforms, including the iPad and mobile phones equipped with web browsers. The website will be updated regularly to take into account fresh developments, so those interested in the MCL should check out the website periodically to find out about breaking news.